The endocrine system is a system of ductless glands that secrete hormones—chemical messengers that are carried for long distances. The endocrine system is a system of ductless glands that secrete hormones directly into the circulatory system to be carried long distances to other target organs that regulate key body and organ functions. The major endocrine glands include the pituitary, pineal, ovaries, testes, thyroid, hypothalamus, and adrenal glands. endocrine system: The system of ductless glands that secretes hormones directly into the circulatory system. The endocrine system is a system of ductless glands that secretes hormones directly into the circulatory system to be carried long distances to other target organs regulating key body and organ functions. For example, the pineal gland, located at the base of the brain, secretes the hormone melatonin, responsible for regulating sleep patterns. Endocrine glands are typically well vascularized and the cells comprising the tissue are typically rich in intracellular vacuoles or granules that store hormones prior to release. Endocrine signaling is typically slow to initiate but is prolonged in response; this provides a counterpoint to the more rapid and short-lived nervous system signals. The endocrine system is in contrast to the exocrine system, which features ducted glands that secrete substances onto an epithelial surface; for example, a sweat gland. Additionally the endocrine system is differentiated from shorter distance signaling such as autocrine (a cell affecting itself), juxtacrine (a cell affecting it’s direct neighbors), and paracrine (a cell affecting other nearby cells) signaling. The major endocrine glands include the pituitary, pineal, ovaries, testes, thyroid, hypothalamus and adrenal glands, additionally other tissues such as the kidney and liver also display secondary adrenal functions. 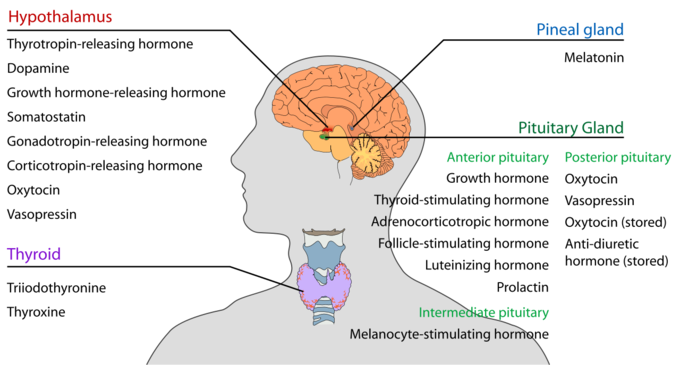 Endocrine glands of the head and neck: The endocrine systems found in the head and neck include the hypothalamus, pineal, pituitary and thyroid glands.